As I began outlining ideas, I heard that the wonderful old pear tree in my mother’s back yard had died. All during my childhood, my mother made the most delicious pear preserves from the sweet, hard pears from that tree. I have never before or since tasted anything like it. My first thought on the demise of that tree was that no one will ever taste those preserves again, because nobody cooks like that any more. This made me think of my grandfather, who buttered his green onions before he ate them. I decided that I wanted to take the opportunity to try and evoke not just the events of the time, but the smells, the tastes, the sound, the hot and cold of it — the daily one-foot-in-front-of-the-other life of a farm wife with nine children. I love the language, too. One of my uncles walked into our house one day and said, “What in the cat hair is going on?” How could I let that fade into oblivion? I plumbed my own memory as well as interviewed many relatives. Many of the details of farm life come from my mother, such as using kerosine-soaked corn cobs to start a fire. May of the incidents related actually happened, both in my family and my husband’s (the less savory ones, he points out). I began writing The Old Buzzard Had It Coming early in 2000. 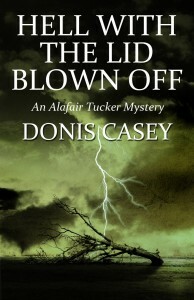 By the end of 2003, I had completed three Alafair Tucker mysteries. Alafair was the name of my father’s maternal grandmother. Tucker was the family name of my father’s paternal grandmother. The name Shaw is an acronym for “Wash”, which is what the real Alafair called her husband, George Washington Morgan. Shaw’s character is much like my own father’s, who was extremely good-natured, though they don’t look alike. Phoebe is named after my maternal grandmother, Phoebe Lois Rankin, known as Lois, who was seventeen in 1912. Phoebe Tucker physically resembles Lois Rankin, as well, and I based her gentle personality on my grandmother’s. John Lee Day is one of the characters in the book who is not based on any relative of mine. I got the idea for John Lee several years ago when I was at a concert of the Black Watch and Cameron Highlanders Massed Bagpipe Bands. John Lee is a very young, very serious, very athletic, rose-lipped, red-cheeked Scottish sword dancer with dewy black eyes and a shag of black hair. I wanted to mother that young soldier the minute I saw him, and I am not the maternal type. Alafair, who is the maternal type personified, was a goner the first time she set eyes on John Lee. Bobby Tucker The tale of Bobby Tucker is based on a true incident that occurred in the 1930’s. The real “Bobby” was my husband’s sister, Lorena Fay, who managed to get behind the pot bellied stove and take a swig from the jar kerosine which was kept as a starter. Lorena Fay, known to her family as Honey, was the youngest of the children at the time, just a toddler. Her mother picked her up in a panic and ran toward town in her bare feet with the baby in her arms, trying to reach the doctor, but she didn’t make it in time, and Honey died. I included this story in The Old Buzzard Had It Coming because it is so hear-wrenchingly real. I’ve heard of similar incidents in several other families. Until recently, babies’ lives were pretty precarious. The first draft of Hornswoggled was written in 2001. The final rewrite was finished in 2005, and the book came out in September of 2006. In Hornswoggled, it is Alice, Alafair’s third child and Phoebe’s twin, who is the focus of the story. Alice is based on my father’s mother, my beloved grandmother Casey. Her real name was Chesner Morgan Casey, but she hated “Chesner”. She changed it to Chesna when she grew up. I asked her once what she would be named if she had a choice, and she told me that she liked “Alice”. So Alice it is. In her youth, (and pretty much in her age, as well) Chesna was a tall, blue-eyed blond, and just as headstrong and contrary as Alice, and twice as witty. She married in 1913. Her life was rather tough, but believe me, she was tougher. Walter Kelley is based on my father’s father, Walter Casey. He was in fact a barber in Boynton, a well-to-do man who owned quite a bit of property in town, including the building in which his barber shop was located. He was married before my grandmother, but the character of the unfortunate Louise is strictly imaginary. I never knew my grandfather Casey. He died in Kansas City in 1931. Like his namesake character, he was affable and universally liked. Especially by the ladies. Sally McBride, Shaw’s half-Cherokee mother, and Alafair’s mother-in-law, is named after a great-great grandmother of mine, Sarah Howard, who was one of the Howards of eastern Kentucky, and the real Alafair’s mother. What Sally Howard was actually like, I don’t know. But Sally McBride’s character is constructed from several old Appalachian relatives of mine. I observed early on that my parents’ generation was sophisticated and civilized, my grandparents were straightforward, competent, and no-nonsense. But my great-grandparents, the ones I knew, at least, were almost creatures from another world, wild as deer, and fey, with a whole other understanding of reality. Thus, Sally McBride. Peter McBride, Shaw’s stepfather, has many characteristics taken from stories my grandmother told me about her step-grandfather, whose last name was Blevins,. He owned a sawmill in Hayden, KY, in the late 1800’s. She said he was “from the old country”, but didn’t know which old country. I made it Ireland. Grandpapa Blevins raised Tennessee Walkers, as does Peter McBride. When she was a girl, my grandmother overheard some men saying that it was very impressive that Mr. Blevins was as successful as he was, considering that he could neither read nor write. I didn’t mention Peter McBride’s literacy skills in Hornswoggled, but in the next book, I have him reading Yeats aloud, so it seems he can read pretty well. I called the character ‘Peter’, because that was the name of Sally Howard’s husband, Peter Wilson. Scott Tucker is based on my grandmother’s cousin Scott Morgan, who was the constable in Boynton, OK, when I was a small child. My character does physically resemble the real Scott, to the best of my childish memory, as does his wife, whose name was also Hattie. My Scott is much tamer than the real Scott, however. The Drop Edge of Yonder was finished late in 2006 and came out in September of 2007. 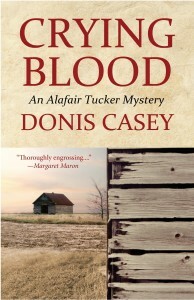 The murder in this book is based on an actual incident that happened to one of my great-great-grandfathers on my mother’s side during the Civil War. He and several other men from his town in northern Arkansas were returning home on leave from the army, when they stopped on the road just outside of town to rob a bee hive. While they were involved, they were bushwhacked – by Red Legs, the tale goes. All of them were killed. My gg-grandfather’s ten year old son found them and alerted his mother and the other wives as the sun went down. The women sat with their men’s bodies all night to keep the critters away, and the next morning buried them where they fell. Mary Tucker is based on my father’s aunt Mary, whom I knew fairly well. She died when I was eight years old. She was known for being extraordinarily good natured and a wonderful cook. Laura Ross is actually based on another of my father’s aunts, whose name was Laura Morgan Ross, and was in truth Mary’s sister. I knew Aunt Laura, and I remember her as being quite gentle. I was a child at the time, though, so reality may have been different from my perception. The two handy men, Kurt Lukenbach and Micah Stark, may or may not be real. I’m not telling, because that would give it away. Suffice it to say that it’s an interesting story. The Kitty Song is a lullaby that my grandmother’s mother sang to her, and my grandmother sang to my mother, and my mother sang to us. I never heard it anywhere else. One of my favorite memories is of my nephew Joe, who was two at the time, sitting on my mother’s lap, listening enraptured as she sang that song into his ear. Joe has his own son, now. I wonder if he remembers? The Sky Took Him began with an idea that came to me while I was on the Oklahoma leg of the book tour for Hornswoggled in 2006. I had set up an event in Enid, OK, because Enid is my husband’s home town and he has several relatives who still live there and this was a good opportunity to visit the family as well as sell some books. I was sitting with my husband and his sister in a restaurant called Pasttimes, the walls of which are covered with historic pictures of Enid. I was facing a 1915 print of a street scene showing two women going into Klein’s Department Store on the town square. You know how they sometimes do the opening of a movie by starting with a still photograph that dissolves into a moving scene? As I sat there and looked at that picture, those two women became Alafair and her daughter Martha on a shopping spree. What, I asked myself, are Alafair and Martha doing in Enid, of all places? They must have relatives there, and something compelling must be going on with these relatives, because there is no other way that Alafair would leave her ten kids and gallivant off to the western part of Oklahoma to go shopping. Martha Tucker, Alafair’s eldest child and the one who resembles her the closest, is named after my father’s eldest aunt, Martha Morgan Mosely. Interestingly, I have a sister named after the selfsame Martha. In my head, Alafair’s Martha looks very much like my sister. But of all of Alafair’s literary brood, Martha’s personality is most like my own. As the eldest child who worries about her parents more than she ought, I can’t help but identify with her. The Sky Took HIm has more strictly fictional characters than any Alafair book I’ve written to date. Streeter McCoy is made-up, though he physically resembles my father. However, I did steal his name from the 1916 Town Directory of Boynton, Oklahoma. The town treasurer was called Streeter McCoy. I know nothing whatsoever about the real guy, but his name is just too good to pass up. I got the idea for Lu from the 1910 Census of the United States. In 1910, there was one person of Asian descent living in Enid. Who was this person, I wondered? Now you know. The Crawfords, Yeagers, Buck Collins, Pee Wee Nichols, Zip,, and Muddy the dog are all fictional. As is Ike. Ike is the last character added to the book, but he niggled at me and niggled at me until I had to add him. It’s a good thing, too, since he brings it all together in the end. CRYING BLOOD is the darkest book of the series so far, based on another story out of my husband’s family history and deals with the consequences of the forced allotment of Indian land in the Indian Territory in the late 19th Century. The only way White people could own land in the I.T. at that period was to marry into one of the tribes and thus become a tribal member. This is exactly what my husband’s great-grandfather did when he married a Choctaw woman named Lucretia in the 1870s and thus gained control of her 160 acre allotment. The family lore is that several of her relatives died under mysterious circumstances and Lucretia ended up inheriting their allotments. I have my doubts that it happened that way, but it did give me a great idea for a story. The original idea behind this series was to be a ten book arc, each book featuring Alafair and a different one of the ten children. However, Crying Blood deals more with Shaw, Alafair’s husband, and his background. He too deals with the consequences of things that happened in his past. We all misunderstand things that go on during our childhood, and end up living with wrong ideas about our parents for the rest of our lives. After John Barger lost his reelection bid in 1918, he became a county “Speed Officer”, whose job was to curb the then-growing automobile menace, and was given a county patrol car to cruise country roads and highways. In 1924, the county’s “speed patrol” car was stolen from the garage by the Lawrence brothers, “Babe” and Bill, young Muskogee desperadoes who were wanted for auto theft in several towns around OK. After several unsuccessful attempts to catch them in OK, the sheriff was notified that the pair had been caught at El Paso, and he sent Deputy Barger and his partner, one Joe Morgan, who happens to have been a cousin of my grandmother’s, to pick them up and bring them back to Muskogee. After taking charge of the prisoners, Barger and Cousin Joe started back with them in the county car. Barger was driving and Morgan was in the rear seat with the Lawrence boys. One great thing about writing historical fiction is that when you do your research, you discover that what really happened is often better than anything you could make up. 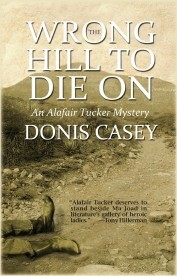 In order to keep from killing off all the residents of Boynton, OK, too quickly, I decided to set the sixth Alafair Tucker mystery, The Wrong Hill to Die On, here in Arizona, where I live, rather than in Oklahoma, where Alafair lives. I figured this would be a nice little diversion for Alafair, and for me as well, especially when it came time to do location research. But Alafair and her husband Shaw have ten kids and run a large farm, so there are a couple of problems I had to solve before I even begin: 1. Why on earth would Alafair go to Arizona in the first place? 2. Once she gets there, what is going on that she could get herself involved in, how, and why? So I hied myself off to the Arizona State University library right here in Tempe and begin perusing the files of the Arizona Republican newspaper for March of 1916, the date I intended to set the novel. I knew I’d find something really good, for after five previous novels set in the 1910’s I’ve learned that life in the early Twentieth Century Southwest was nothing if not action-packed. Was I ever right. First, the end of 1915 and the beginning of 1916 were some of the rainiest months in years, accompanied by severe flooding in the entire western part of the United States. Therefore, there was a lot of flu and bronchitis going around – enough that it was mentioned in the newspapers of the time. Handily, in the late 1800s through the mid-1900s, Arizona was known as a place for people with chronic lung problems to come and let the dry air cure them. An excellent motivation for travel. You may also remember from your Junior High history that there was a revolution going on in Mexico at the time, as well as a very big war in Europe. The Mexican Revolution interested the Germans no end, and there were lots of German “military advisers” in Mexico. They would have been more than happy to see the U.S. invade Mexico, or vice-versa, so that the Americans would be too distracted to help the British or otherwise get involved in WWI. Therefore, the aforementioned “military advisors” were not above some skullduggery to make sure U.S.-Mexican relations remained tense. Even better, in the first three months of 1916, residents of the entire Southwestern U.S. were hysterical over the possibility of a cross-border invasion from Mexico by the Revolutionary Army of Pancho Villa. In fact – and now that almost 100 years have passed, I can be happy about it – in March of 1916, the Villistas did exactly that, increasing the hysteria to a fever pitch. Since God is good, and just for icing on the cake, during the winter of 1915-1916, a major (silent) motion picture, The Yaqui, starring Hobart Bosworth, was being shot in Tempe, the very town in which I currently reside, and one of the more exciting scenes involved using 700 pounds of TNT to blow up an abandoned schoolhouse outside of town. Plot points and atmosphere galore, and all I had to do was spend an afternoon unspooling microfilm reels in the basement. The character of Elizabeth Kemp, Alafair’s youngest sister, is based somewhat on my own youngest sister, who is tall, dark, and beautiful and too intelligent to be able to fit easily into the ordinary world. Her circumstance is taken from an actual incident that happened in the late 1940’s to my husband’s aunt, but I’m not going to tell you about that because it’s a huge spoiler. Alafair’s daughter Blanche, her eighth child, is named after my great aunt Blanche. Blanche Tucker is only eleven years old in this book, so there is much more of her story to come. Hobart Bosworth, Marshal Joe Dillon, Fred “Cap” Irish, Dr. Benjamin Moeur, and Fr. 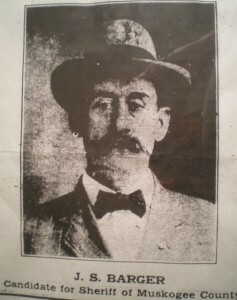 Lucius Zittier were real people who inhabited or were well known in Tempe in 1916. I tell some fascinating facts about all of them in an addendum to the book The rest of the Kemps, the Stewarts, the Carrizals, and the Arrudas, are fictional. 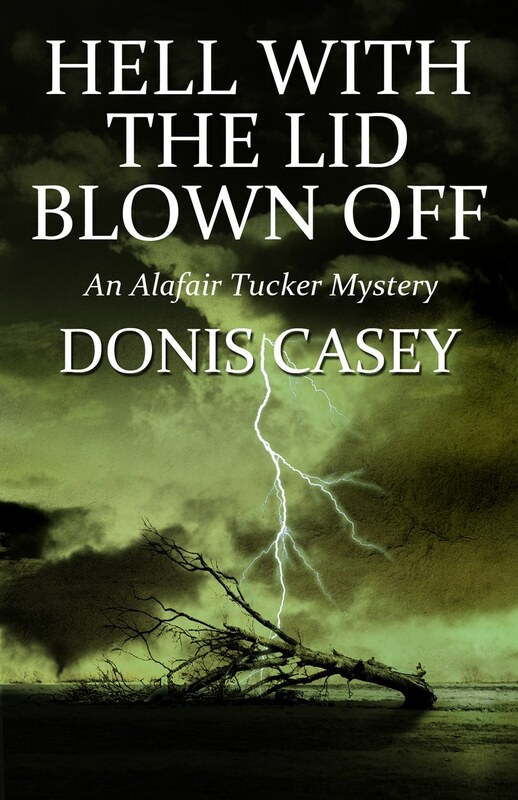 HELL WITH THE LID BLOWN OFF (June 2014) is about a tornado. 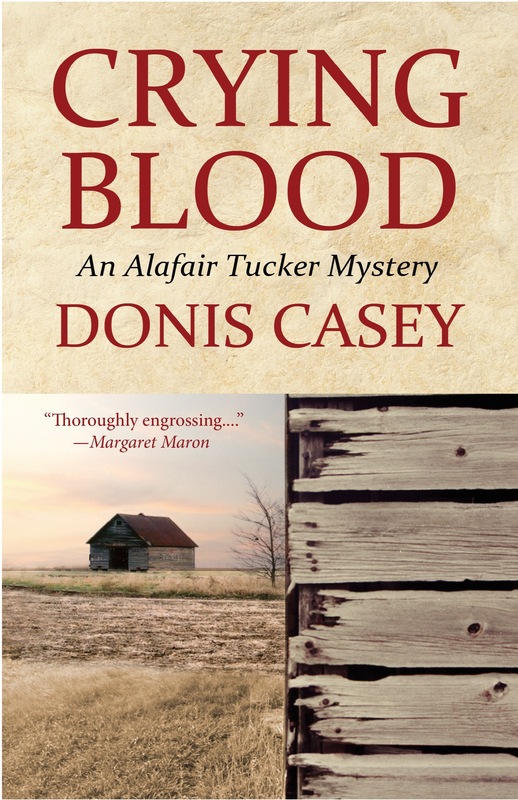 This will be the seventh installment in my Alafair Tucker series, which is set in pre-World War I Oklahoma, but the first one that deals with the aftermath of a killer storm. 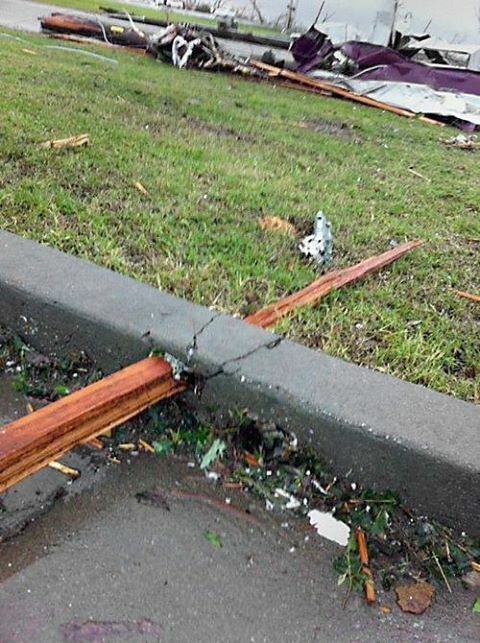 Because, I thought, I can’t write a series set in Oklahoma and not write about what life is like in tornado alley. In The Wrong Hill to Die On, I sent Alafair, Shaw, and Blanche on a trip to Arizona to visit Alafair’s sister and allow the ailing Blanche to take advantage of the salubrious climate. 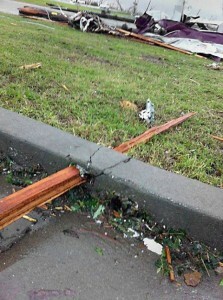 Most of Alafair’s huge family was left behind in Oklahoma. For Hell With the Lid Blown Off, we’re back in Oklahoma and back with the whole gang. And the whole gang just keeps getting bigger as the years pass. By now all four older girls are engaged or married. The book starts off with one grandchild and ends up with four, plus six year old Chase Kemp, Alafair’s nephew whom she brought back with her from Arizona. I always try to do something different with each book, and in Hell I used some first person narration for the first time. The character of Trenton Calder is fictional, but he doesn’t feel that way to me. Red-headed Trent has been lurking around in the background as Sheriff Scott Tucker’s deputy every since The Old Buzzard Had It Coming. Now he is front and center, and falling for the middlest of Alafair’s children, Ruth. Until this book, Ruth has been she of the freckled face and skinned knees who rides like the wind and plays the piano like an angel. But now she finds that men are looking at her differently, and she has no idea why or how to behave in her unfamiliar womanly face and body. Ruth’s employer and mentor, music teacher Beckie MacKenzie, looks just like a friend of mine, though her personality is quite different. The Eichelbergers, the Welshes, Dr. Ann and Dr. Jasper Addison (who is inspired by my great, great uncle, Addison Bourland, a doctor) have all been inhabiting Boynton since the beginning. Wallace MacKenzie, Randal Wakefield, and the Beldons (thank goodness) are all fictional.